Here at HVAC.com, we believe that the best approach is to work with a local, trustworthy heating and air conditioning contractor. 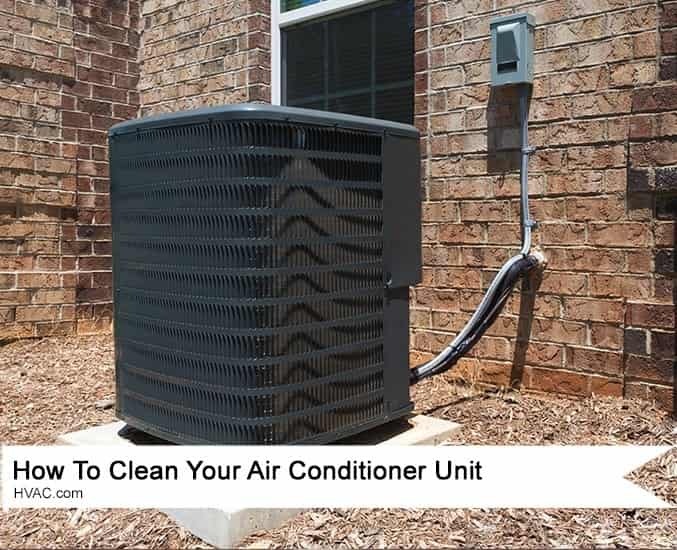 However, if you’re the do-it-yourself type, you can clean your air conditioner unit with these essential maintenance steps that should be conducted each year. You can clean the exterior condenser as well as the accessible areas of the indoor evaporator. In just a few hours with no special tools, you can give your AC system the thorough cleaning it needs to work efficiently all cooling season. In order to accurately test your AC unit after you’ve performed cleaning tasks, it needs to be at least 60°F outdoors, so reserve performing maintenance tasks for a day when the weather is warm enough. IMPORTANT! Turn off power to the unit at the exterior shutoff, also called a “disconnect”. Also, shut off power at your home’s electrical panel. Using a wet/dry vacuum with a soft-bristled attachment, vacuum away dirt, leaves, grass, and other debris from the fins. Remove all brush, vegetation, and debris from around the condenser. If any of the fins are bent, you can use a fin comb or other thin object to gently and carefully straighten them out. Be careful not to stick the knife more than a half-inch inside the unit or make contact with the (usually) copper tubes that carry the refrigerant. Remove the top grille, carefully lifting out the fan. Place it in a safe location and don’t pull at the electrical wires attached to it. Remove any debris from inside the unit and wipe the interior clean. From inside the unit using your garden hose, gently spray the fins. Be careful to only use moderate water pressure. Turn the electricity to the unit back on at the outdoor switch and the electrical panel. Make sure your thermostat is set to ‘cool’ and lower the temperature setting below the current temperature to trigger the unit to turn on. After about 10 minutes, feel the tubing that runs from the condenser to the house to ensure the unit is working properly. The insulated tube should be cool to the touch and the uninsulated tube will be warmer. IMPORTANT! Turn off the power to the unit at the furnace switch as well as at the main electrical panel. Remove your furnace filter and replace with a new one if necessary. Open the panel to expose the blower compartment. Gently vacuum away any dust and debris that have collected in the chamber. Locate the condensation drain tube and gently disconnect it. To prevent algae growth, you can either replace the tube or clean it using a bleach and water solution of a 1:16 ratio. Pour the solution through the tube. Clean the drain port using a soft-bristled brush or pipe cleaner to remove any debris which have collected here. Turn the power back on at the furnace switch and at the electrical panel. If you are uncomfortable performing any of these air conditioner cleaning steps or have questions, please don’t hesitate to contact your trusted HVAC professional. Also, remember that your air conditioner needs professional maintenance each season as well, so don’t forget to schedule your tune-up! Your AC unit, a necessity in most homes. It’s that big, ugly box that sits outside your house, sticking out amidst the beautiful landscaping you’ve worked so hard to create and maintain. You can’t change the face of your exterior air conditioning unit, but you can disguise it! Through some creative DIY and a bit of elbow grease, you can hide your air conditioner unit (eyesore) and build a cover that has some great benefits. Add a bit of beauty to your yard, protect your air conditioning unit from landscaping and yard debris, and even deter theft! Copper theft from air conditioners does occur; hiding your unit out of sight will help to prevent your home from being a target of this expensive crime. 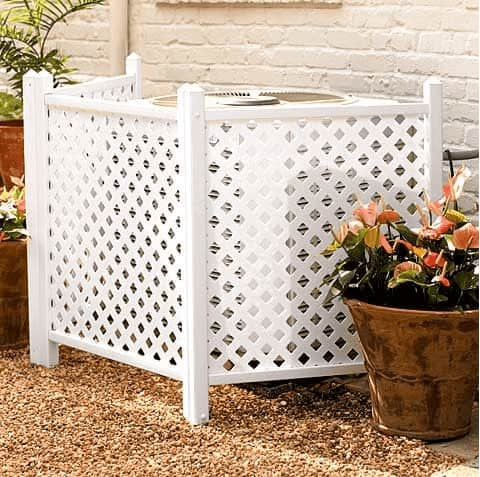 If your unit is located where it is visible to anyone passing by, or in an area not protected by a locking fence and gate, creating a DIY air conditioner cover is a smart idea. No matter what you create, your air conditioner should still be accessible. In the event your unit requires repair, your HVAC technician needs to be able to access the exterior air conditioner, so make sure there is an easy access point, such as a removable panel or open side at the rear of the unit. Do not limit airflow! Air needs to flow freely around the exterior air conditioner for it to function properly. If your cover is positioned too close to the unit, it won’t receive adequate airflow. Create a design that leaves plenty of space between the cover and the air conditioner to allow air to reach the unit. 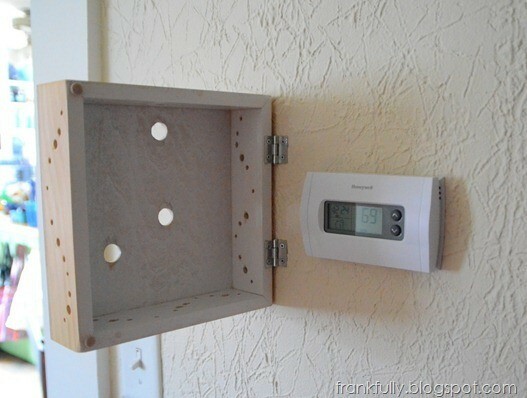 Below are some examples of great DIY air conditioner covers to help inspire you as you get to work planning your own DIY air conditioner cover design! Go all out and create a real work of art that not only covers your air conditioner, but makes a beautiful addition to your landscaping. Build a quick and easy air conditioner cover using premade lattice purchased from your local hardware store. Let us know if you try this! We would love to see your finished project! And as always, if you need help with installing or maintaining your AC unit, feel free to browse HVAC.com’s Contractor Directory to find an AC technician to help.